You are here: Home / Why Learn to Quilt? Have you ever thought about learning to quilt? Maybe you’re an aspiring quilter who’s just getting started sewing and would like to make a quilt for a friend or family member. Perhaps you already know how to sew or are learning, and you’d like to quilt but it seems like a daunting task to take on. 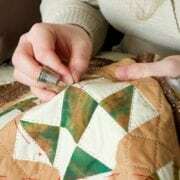 Quilting can be a fun and rewarding process for many reasons, and if you take the time to learn the proper technique and create it piece by piece, you will end up with a beautiful finished product that you’ll be proud to share with others. Let’s look at just a few of the reasons why quilting is an enjoyable, satisfying experience to learn and skill to have. When you’re creating a quilt design, the world is your oyster. You can pick any fabrics and combination you’d like; you get to play and make it any way you want! No rules. You can create your own design in the center or cut pieces of fabrics and make geometric patterns; you can follow a color scheme and make it look sleek or wild or bright. If designing a quilt for a baby or child, you can quilt patterns of animals, characters, outer space, flowers, cars or trains, hearts, or even a personalized name quilt…anything you can come up with! The key to creativity is visualizing what you’d like to create and then choosing colors and fabrics. Once you’ve completed the quilt, you can even create a couple pillow covers to go with it and complete the look. You can even choose a simple patchwork or rag-style quilt and make it look unique with different patterns or textures. If you feel like you’re fresh out of ideas, look online—once you start browsing the quilts others have made and posted, you’ll be bursting with ideas of your own. If you’re nervous, start out with a simple design and think of it as your tester, one you’ll keep and use yourself. You may be surprised how much pressure it takes off when you think of it that way—and chances are, it’ll turn out better than you expected. So pick your fabrics and have fun! Who doesn’t love receiving a handmade quilt as a gift? Anyone can go out and purchase a factory-made, nice-looking but standard quilt set that will probably fall apart in a year or two. But when you give someone a comfy handmade quilt that you put time and effort into, not only will it last longer, they will appreciate it because it was made especially for them. There is something so much more homey and personal about a handmade quilt, and as detailed below, you can create many other types of gifts for family and friends as well. Also, you can make a quilt for a wedding or anniversary gift, a birthday present, or to celebrate another event such as a graduation or birth. You can bet that if you make someone a quilt, it will not be forgotten. A quilt for a child, grandchild, niece, or nephew may even become their favorite blanket! When you learn quilting skills, you can make so much more than quilts. 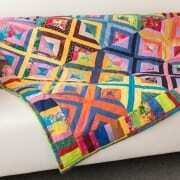 Yes, homemade quilts are amazing, warm, and comfy, and you can also make quilts for children or babies. But you can create so many other things with quilting techniques! Think of the possibilities: table runners, wall hangings, quilted jackets or vests, placemats, napkins, pot holders, centerpieces, purses and tote bags, cosmetic bags, toys and dolls, pillow covers, all kinds of decorations. The list could go on! You’ll be able to create many types of gifts for friends and family, things to display around your home—things that you worked hard on and can be proud of. You may even find yourself designing new items and taking them to a craft fair! Never underestimate what you can do with quilting. Yes, creating an entire quilt is a large and time-consuming process. Perhaps you’ll want to start out quilting smaller items like wall hangings or pot holders and work your way up. But think of that wonderful sense of accomplishment when you have a finished product of any kind! Even if you begin with using your quilting skills to create a set of placemats or another small item—a completed project that you designed and made on your own is worth being proud of. Once you see what you can do with a small project, move up to a bigger one, and before long you’ll be ready to tackle a full-sized quilt. 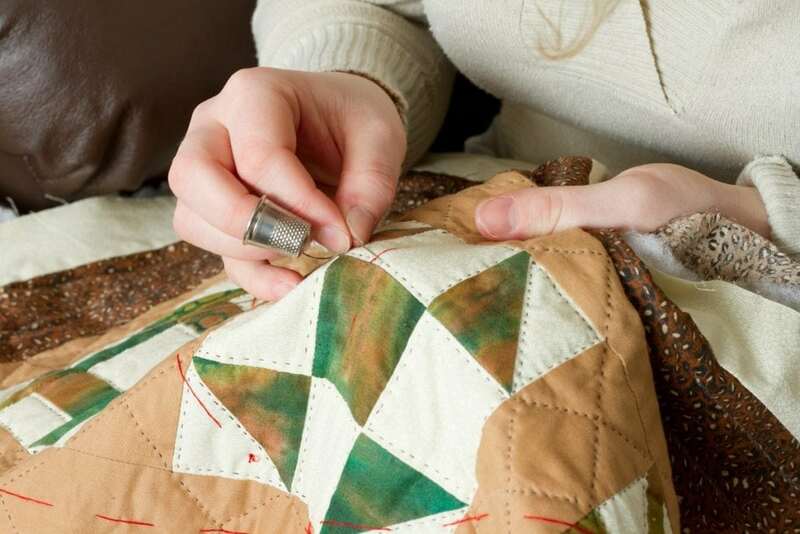 Creating items with sewing and quilting is a confidence booster, is good for concentration and relaxation, and allows you to show your artistic side. Your right brain gets some exercise while producing endorphins and serotonin, so you’ll feel great by the time you’re done. When you’ve completed a full-size quilt, you’ll be ready for anything! Before you know it, you’ll be quilting left and right, surprising yourself with all of your completed projects. Once you’ve exercised your creative talents and completed a quilt or five, you may even consider quilting for charities. Several charities collect handmade quilts for homeless, veterans, patients, and so on, and they will pass your finished product on to some who will appreciate it more than you can imagine. In fact, your quilt may be the only thing that gets a person through a harsh winter or comforts a sick child in the hospital, so you can feel good knowing that your hard work and creativity will be put to good use. Creating handmade projects takes time, patience, and skill—as does creating anything, whether it’s good food, a novel, music, or the like. Nothing that is good quality is made overnight, and there is a reason for that—things that are thrown together don’t last as long and aren’t as high quality. While quilting takes time to learn and perfect, give it a try; you just might find you enjoy the journey as well as the end result. The Inspired Sewist offers classes, supplies, and machines for all your sewing needs as well as repairs and sewing furniture. We can help you learn new techniques or inspire you to get started, guiding you through any project you’d like to complete. Contact us for all your sewing and quilting questions.